Hockney’s unstinting admiration for Van Gogh is demonstrated in an exhibition at the Van Gogh Museum, Amsterdam, Hockney–Van Gogh: The Joy of Nature (until May 26) which illustrates the influence that the troubled Dutch genius has had on Hockney and how their work shares many characteristics. The 81-year-old Hockney is himself an enthusiastic user of the iPhone as a device to create drawings and as he told his biographer Martin Gayford: “I think van Gogh could draw anything and make it enthralling. Observing such kindred style and a shared spirit of adventure it’s worth recalling the great difference in their backgrounds. Although they shared similar early years — Hockney grew up in industrial Bradford and van Gogh in the coal-mining communities of Brabant in the Netherlands — the Englishman’s talent was recognised early. He attended the Royal College of Art in London, where he met artists such as R.B. Kitaj, Allen Jones and Patrick Caulfield and followed the lead of the fashionable American art movements of his day such as Abstract Expressionism and Pop Art. He moved to the bright lights of California in the Sixties and instantly made a splash with his paintings of sunlit pools, fast cars and fit young men. Van Gogh, as we know, suffered for his art. His artistic career was not his first calling, instead he became a lay preacher and until well into his twenties he remained celibate and a loner, living in poverty. No one detected any great artistic talent, not even when he decided at the age of 27 to take to drawing. It was as though he shared the alienation of the world portrayed in his works, especially as he compounded that disaffection with a succession of fruitless love affairs. 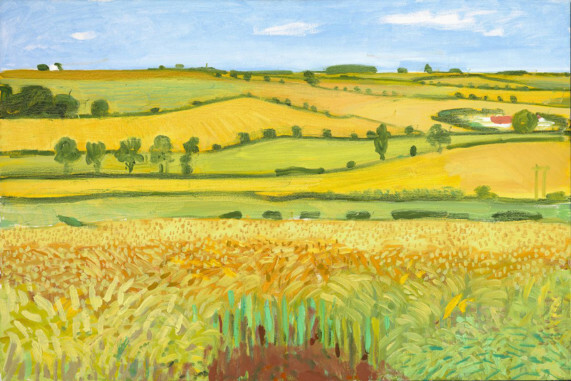 In the two years up to his death in 1890 the shared qualities of the work by the two artists can be clearly seen with the comparison of Hockney’s later work depicting the wolds and wilds of Yorkshire with van Gogh’s images of Provence. Hockney had never considered England as a worthwhile subject, steadfastly preferring the sunnier climes of Egypt, Morocco, China and Japan but roundabout his 60th birthday in 1997, Yorkshire reclaimed him and he returned to his Bridlington home. It is easy to perceive the two artists’ fascination with nature, their use of strong colours and bold strokes and their experimentation with perspective. Van Gogh even used a square wooden frame with horizontal and vertical wires which formed a grid to give him a precise sense of perspective. Just as it is impossible to imagine Provence without van Gogh’s blazing colours, Hockney has laid claim to Yorkshire with his own visual record with landscapes which follow the four seasons with the constant changes of light and space demonstrating his love of nature. 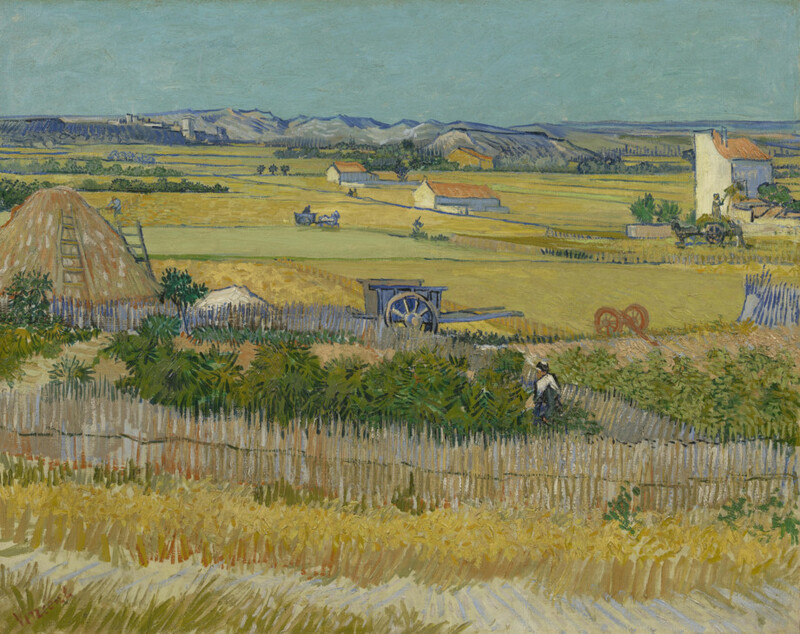 There is an obvious similarity with van Gogh’s landscapes such as The Harvest (1888), Field with Irises near Arles (1888) and The Garden of Saint Paul’s Hospital (‘Leaf-Fall’) (1889) with the tall straight trees, open fields and light playing on the shadows. Big skies and distant horizons. Wheatfield with Partridge (1887) has a similar swirl of grass buffeted by the wind to Hockney’s Wheatfield off Woldgate (2006), although electricity pylons replace the partridge in the Yorkshireman’s version. 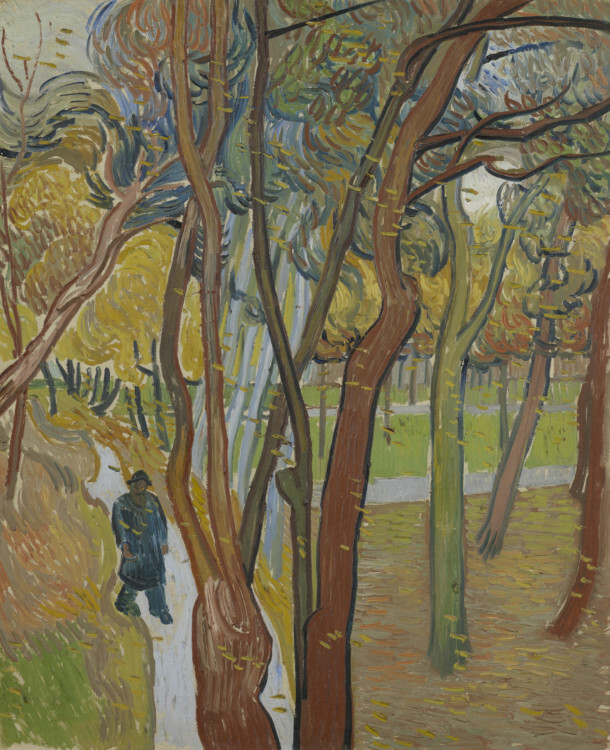 The exhibition also focuses on the sketches made by the two men — van Gogh’s work in pen and ink such as Landscape with Pine Trees (1889) and Thistles by the Roadside Pine Trees (1888) and Hockney’s pieces on iPhone. Hockney is full of praise for van Gogh’s sketches, particularly the early work like the meticulous drawing of of a barn made when he was 11 in 1864 given to his austere father and from 1883 the view from his lodgings over a carpenter’s yard.